In the summer of 1992, I collapsed after a weekend of birthday partying that included a road-trip to San Diego. My (pre-Princess) girlfriend rushed me to the UMC Emergency Room, and it was determined, through a tortuous process better-suited to a David Cronenberg movie, that I was suffering from several bleeding ulcers. The prognosis was not good. I had hemmorhaged so much blood that I was in danger of major organ failure. I was hooked to transfusion pumps in both arms and left in an ICU bed to see if I would make it. Since my fainting spells ended as soon as my blood pressure stabilized, I was conscious, wondering if I would live through the night. That night was my road to Damascus. While I didn't exactly find religion, I did resolve to change for the better. And, by & large, I have. The behaviors and stresses that led to those ulcers have been dealt with, and I really feel that I became a better person after that night. Not perfect, mind you, but better. But I also know that what really saved my life was blood. This is why I donate. 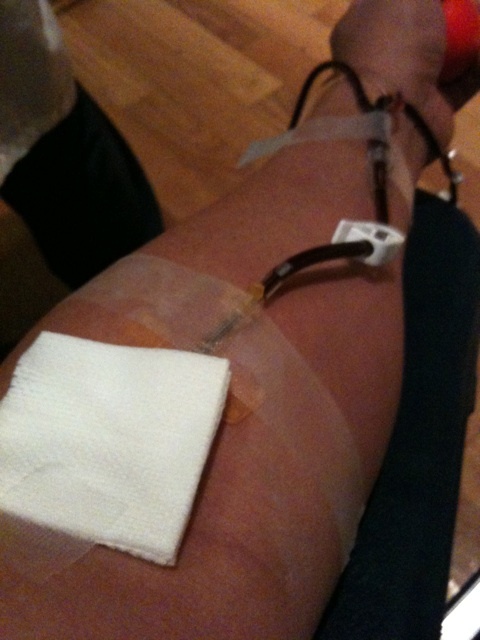 This is a shot of my left arm as I donated blood at a recent Blood Drive by United Blood Services. It looks worse than it felt. The Blood Drive was at Sunset Station, which is conveniently close to where I live. Because there is no substitute for real blood (ask any vampire! ), blood donation is one of the easiest ways you can give back to your community. It saves lives, pure & simple, and the stark truth is that over half of us will need some sort of blood transfusion some time in our lives. I sure did. For the last 2 times I've donated blood, I have agreed to a "double red cell" donation instead of the usual pint of whole blood. It's a procedure that extracts the red-blood cells from your blood, returning the plasma (along with some saline) to your bloodstream. This allows you to donate 2 units of red blood cells per visit, instead of just one, without endangering your own health. Also, this procedure uses a smaller needle, and, because of the saline they add back into your bloodstream, you actually leave the event more hydrated than when you entered. It's what United Blood Services calls a "win-win" situation. Of course, the "double red cell" donation process takes almost an hour, while the traditional whole-pint donation takes less than 30 minutes. But I really don't mind the extra time it takes. I always bring a book with me. And, while you can donate every 8 weeks using the whole-pint method, you can only donate 3 times per year when using the "double red cell" method. But scheduling 3 visits per year is much more convenient than finding time for 6, right? Another benefit of donating blood is that you get a free blood-pressure check and cholesterol screening every time. Plus, when you visit a Blood Drive, there are always little treats. The last time I donated, I got 2 free movie tickets. This time, I got a t-shirt and 2 free passes to the Sunset Station buffet (which I handed to a blue-haired woman playing penny slots). Woo hoo! But the real benefit of donating blood is the knowledge that you're doing something that helps others in a very important way. Think about it. Blood is vital, and your donation could actually save someone's life. Call United Blood Services to find the nearest Blood Drive and set up an appointment. You won't regret it. ur so cool JJ glad i got to know u as a coworker and friend.